By John F. McKenna (McJack): There has been much conjecture on how WBC welterweight champion Floyd Mayweather Jr. (42-0, 26 KO’s) will be impacted by his 90 day incarceration in jail for domestic violence. From a physical aspect there should be little or no impact with Floyd being out of circulation, particularly when you take into consideration that he more than likely will not serve a full sentence. 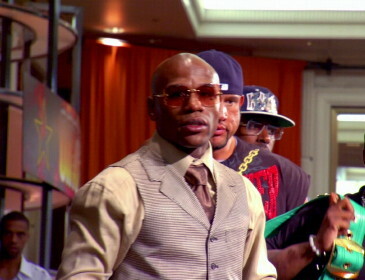 After all “Money” Mayweather has had much longer absences from the ring prior to his jail sentence. To Floyd’s credit he has never been an abuser of alcohol or drugs and always stays in tip top condition, even between fights. When taking into consideration Mayweather’s marketability for a possible fight with WBO welterweight champion Manny Pacquiao (54-3-2, 38 KO’s) the only impact to that fight if and when it is ever signed is how much lead time will be needed. Without a doubt the promoters for such a bout will go above and beyond anything that has ever been done in boxing before in the promotion of a fight. A tour encompassing several cities in the Philippines as well as a coast to coast tour in the United States is a given. The hyping of a Mayweather – Pacquiao fight would be extensive. If HBO lands the rights to air the “Super Fight” on Pay Per View (PPV) the cable giant will without question utilize the very effective 24/7 reality series for promotional purposes. In addition Mayweather and Pacquiao would certainly make the rounds on the late night TV circuit as well as appearing on CNN. In essence, no stone will remain unturned in the promotion of a Mayweather – Pacquiao fight. Rather than hurt the marketability of Mayweather, his jail time will only add to the drama in the build up to the fight. His short time away will only whet the appetite of boxing fans who have been clamoring to see the “Super Fight” for several years now. An unforeseen benefit in the delay in putting together a Mayweather – Pacquiao fight will be the opportunity Manny has to redeem himself after his disappointing performance against WBO/WBA lightweight champion Juan Manuel Marquez on November 12th. A loss by Pacquiao in his next fight of course would be a catastrophe and end any talk of a fight with Mayweather. In any case, history has shown that when too much time is allowed to pass when attempting to put together a major fight circumstances often get in the way and the hoped for fight never happens. « Why is Pacquiao being matched against so many faded fighters?